Bacon! Recently in the news, the bacon debate is a terrific topic for persuasive essay writing. If you’re teaching persuasive essay, this is the perfect topic to use as a whole-class topic or as an individual topic. Oftentimes, I begin my persuasive essay unit by writing a model persuasive essay with my class. This whole-class essay serves many purposes. It models how to write introductions, thesis statements, counterclaims, and rebuttals. The list of potential minilessons can go on and on. Create a fun topic like “Is bacon okay to eat? Guilty? Or wrongly accused?” This is a great way to increase student engagement in the writing process. Students will enjoy reading articles about bacon and the different sides of this debate. Create a digital bin on the topic with the following links. Always preview the links prior to allowing students to use them, as ads may pop up or the content may not be appropriate for your age group. Typically found wearing mismatched socks, Dana Johansen spends her time teaching fifth grade in Connecticut, negotiating with her yellow lab about doggy dinner options, and plopping down on the floor in bookstore aisles to find new reads. She has taught elementary and middle school for fourteen years. Dana is a doctoral student at Teachers College, Columbia University where she studies blended learning in reading and writing workshop. My sixth- grade students are finishing up their argument essays this week. I have found the strategies an d suggestions in The Research-Based Argument (Lucy Calkins, Mary Ehrenworth, and Annie Taranto) and by TCRWP invaluable. In the past I’ve allowed my students to select individual arguments. I’m sure I’m not alone. I’m sure I’m not the only one who tried desperately to juggle 20 to 25 different topics and issues and provide feedback and support of great substance to each student. It’s an impossible task. 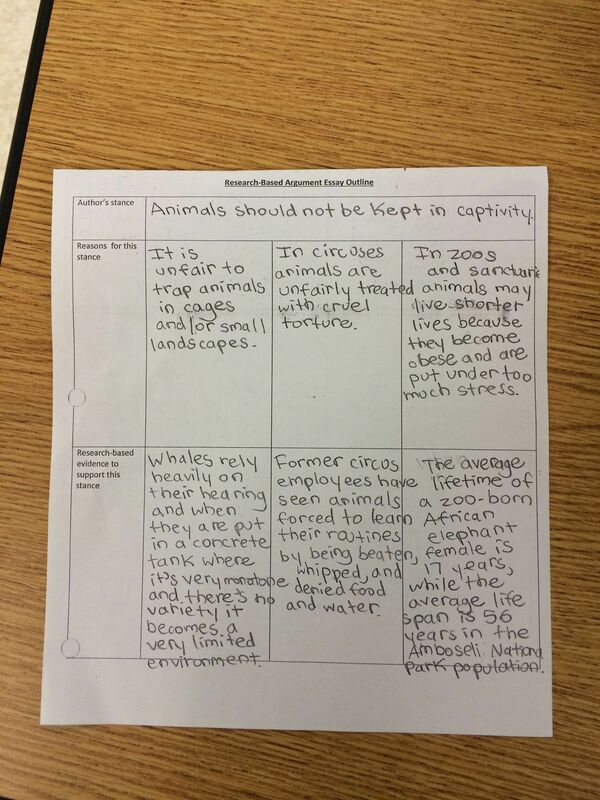 This year, my class chose one topic: Should animals be held in captivity. My students are doing some of the best writing I’ve seen in all of my years of teaching. Here’s why. Having one topic enables all students to engage in conversations about an issue where they each can contribute. Have you ever had to peer-review a paper and struggled because you just didn’t feel knowledgeable about the topic? Sure, you’re able to provide feedback around the basics of writing: clarity, organization, style, mechanics. But when you know the topic well, there’s just so much more you can offer. Together, we created a digital bin that contains interviews, videos, and articles about the topic animals in captivity. Although students are working with the same topic, they are each able to research individually by selecting the texts they want to read from the digital bin. 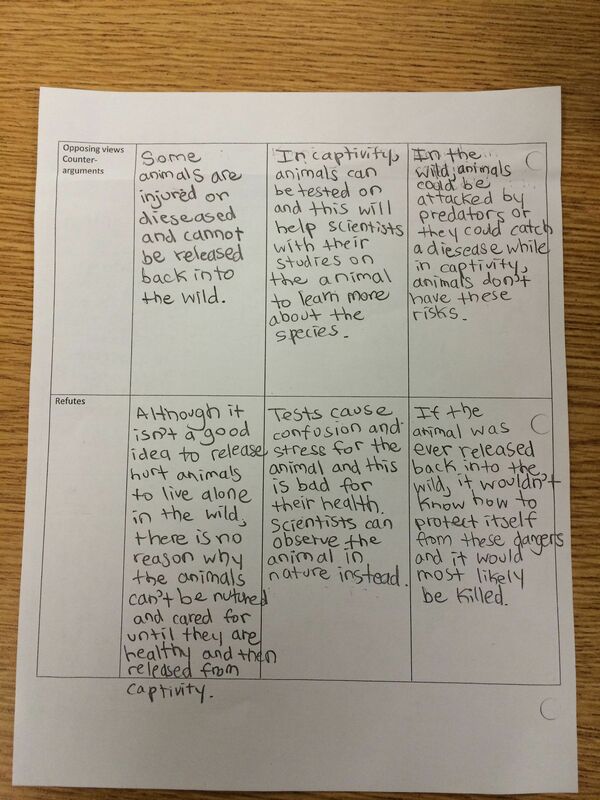 Using graphic organizers as they navigate each text, students take notes on the different perspectives the texts provide and they collect researchable evidence that supports each perspective. Each day, students work in small groups to discuss the research they’ve read. Then they write researchable facts on sticky notes that give reasons for or against the issue. Here’s a chart I created for my classroom, inspired by a similar ch art in The Research-Based Argument. This is such a helpful chart for all students, particular my novice readers and writers. As they continue to navigate the digital bins and research this topic, we are reminded that this is a complex issue and we discuss the importance of suspending judgment in order to glean as much information as we can from our resources.